This is one of my favourite main course dish. 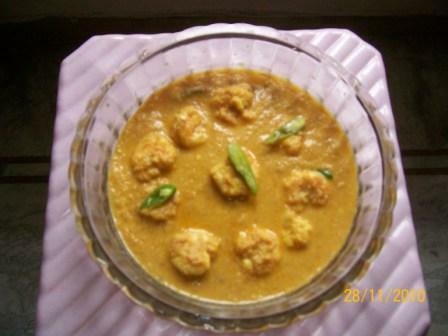 The dish is really tasty dish and I prepare this at home almost regularly. Bengalis call this dish as “chigri macher malaikari” – one of the most loved recipe among them. Marinate the prawns with turmeric powder and fry it slightly. Take ghee and oil together in a frying pan and add all the above ingredients, except the coconut milk and salt, and saute it well. Now add the fried prawns and mix well. Add salt to it and stir well. Once the gravy becomes a bit thicker, add the coconut milk and bring it to boil. Sprinkle a little bit of garam masala and the tasty prawn is ready to go to your plates.